After struggling to take advantage of runners a few days prior in Frio County, there was no doubt left by the girls in blue when rival Lytle came to town last Friday evening. The Lady Mustangs belted out 16 hits compared to two surrendered by Freshman Abi Woodson. 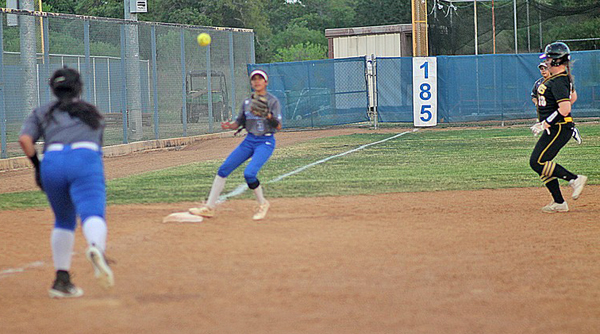 Natalia scored runs in five of six innings en route to a 6-inning run-rule victory over Lytle by a score of 12-2 allowing Natalia to improve to 22-4-1 overall and 3-0 in 30-3A. Freshman Woodson pitched in her 14th game of the season. She pitched 6.0, allowed two hits, walked one and struck out ten pushing her season total to 147 strike-outs which happens to lead the entire San Antonio area for Ks. She did allowed two runs, 0 of which were earned. To start off the 1st inning, Woodson struck out the first two Lady Pirates before Natalia turned a 1-3 defensive play for out three. After watching Taty Alvarado ground out to start the game, KK Lara was able to get on courtesy of an error. Natalia’s Trista Vera then hit into a fielder’s choice, which the Lytle defense got Lara at 2nd base. Natalia then used a Gabi Santoya walk, a single by Abi Woodson, an error by Gabby COntreras and a single by Gabby Munoz to score in three runs to take the early lead. In the top of the 2nd inning, Woodson struck two more batters out before Natalia forced a 6-3 defensive play. Lytle did strand one runner thanks to getting on base thanks to a Natalia error. Natalia didn’t score in the 2nd inning, despite accounting for three singles. Woodson was a power to reckon with in the top of the 3rd, as she sat down three straight Lady Pirates. Natalia took control of this game in the bottom of the 3rd. Natalia used a Woodson single, a Munoz single and an Ally Chavana single to score two additional runs to take a commanding 5-0 lead. Natalia was able to add one run in the 4th to take a 6-0 lead before the Lady Pirates produced their only offensive runs of the game. The Lady Pirates scored their two runs in the top of the 5th. The black and gold used two singles, a fielder’s choice, a walk and a ground out to produce the runs. The girls in blue finished off rival Lytle with one run in the 6th and fives big runs in the 7th to run away with their 12-2 victory. This marked their first district win versus Lytle since the mid 1990s, but their second win of the season versus the black and gold. “We couldn’t be more proud of how our girls came together, played with class and continued our tradition of winning,” Cortana’s said. At bat: Chavana 1-4-2RBIs, Vera 2-4-2runs scored, Alvarado 3-5-2runs scored, Munoz 3-4-3RBIs-2runs scored, Contreras 1-4-1RBI-1run scored, Lara 2-5, Woodson 2-3-1RBI-3runs scored, Woodson 2-3-1RBI-3runs scored, Perez 1-4-1RBI-1run scored, Santoya 1-3-1run scored. Defensive Put-Outs: Vera 11(played catcher vs. Lytle), Contreras 4, Alvarado 2, Lara 1. Assists: Munoz 2, Woodson 2, Alvarado 1, Lara 1. On press night the Lady Mustangs battled in Jourdanton to see who would take the lead in 30-3A. This coming Friday, the Lady Stangs begin the second round of 30-3A action with a trip to LaSalle County to face the Cotulla Cowgirls. Tuesday, April 9th Natalia is open.